As you probably know, BlackBerry's CEO John Chen has made it a mission to increase the value of BBM. Ever since Facebook offered $19 billion to buy WhatsApp, Chen has realized that he has one of those new fangled messaging apps inside his own company. So Chen went into "crown jewel mode" by trying to increase the number of eyeballs that use BBM. The simple math is that WhatsApp was sold for $42 a subscriber. By opening up BBM to iOS, Android and (eventually) Windows Phone users, Chen is merely building up the value of the application. The executive is also building up the value of BBM by monetizing the service. He is allowing companies to sponsor discussion groups known as BlackBerry Channel. And, he is selling stickers that are brighter and more emotive than emoticons. The latest update to BBM brought the BBM Store to the messaging app, which is where the stickers can be found. One of the latest sticker packs, available around the globe, contains images from South Park. This is about as raw as things get for a company that prides itself on selling to the usually pinstriped enterprise. The South Park stickers cost $1.99 from the BBM Store, and include all of the major characters from the show. Can Trey Parker and Matt Stone, the creators of South Park, save BlackBerry? Well, they already helped Broadway with Book of Mormon. No whatsapp or viber for me. Morons Selling user data. 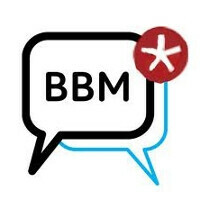 BBM is much better than WhatsApp or Viber. While the latter two may be able to boast more users, BBM users engage on BBM far more than them. That's because it's a better experience. Tried both Whatsapp and Viber. Both were lacking in user experience. Just because something boasts more users, doesn't make it better. Those two may have more people signed up, but they're not using it, while BBM has less signed up users but boasts more engagement and activity per user.